Wow, it has been a few weeks since I have posted anything for 'Sew Crafty Friday'! My project is not completed, but I thought I would share it anyway. Do you have a crafty project to share? Stop by Shereen's blog and add your post to Mr Linky, and see what other bloggers are working on. This is a dishcloth I am knitting. 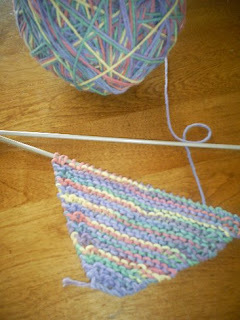 Since the craft cotton is so bright and colorful, I am just using the basic dishcloth pattern. I realized after I uploaded my picture that I photographed the wrong side. lol :o) Oh well, when I post the finished product I will make sure to get the right side. Posted by Lisa at 12:14 p.m.
May 25, 2007 at 2:46 p.m. This is a wonderful yarn for dishclothes! I look forward to seeing the finished product! How long does this take you from start to finish?? May 25, 2007 at 4:39 p.m. Thanks for your kind comment on my blog regarding the fleece blanket! Love your dishcloth, even if it is a photo of the wrong side! I wish I could knit, but after crocheting for years, knitting just doesn't make sense to me. Can't wait to see it finished! May 26, 2007 at 11:07 p.m.
Wow, I just might have to get myself a pair of knitting needles. I haven't done it in years--I'm more of a crocheter. I have a supply of crocheted dishcloths I use all the time instead of icky sponges. That yarn you used is so pretty! June 3, 2007 at 8:25 a.m.